Looking for clues to Star Wars: The Last Jedi? Claudia Gray has the answer, but finding them is another thing altogether. The back cover of her newest book, Leia: Princess of Alderaan, says that there are clues about the upcoming Star Wars film within the pages of the book. But what they are is not clear. Could there be characters from the book that will appear in the film? Will there be a planet they visit that is key to the Resistance because of the novel? Whether you find the clues or not, this is an extremely well-written book with an intriguing story. It will capture your attention from beginning to end. 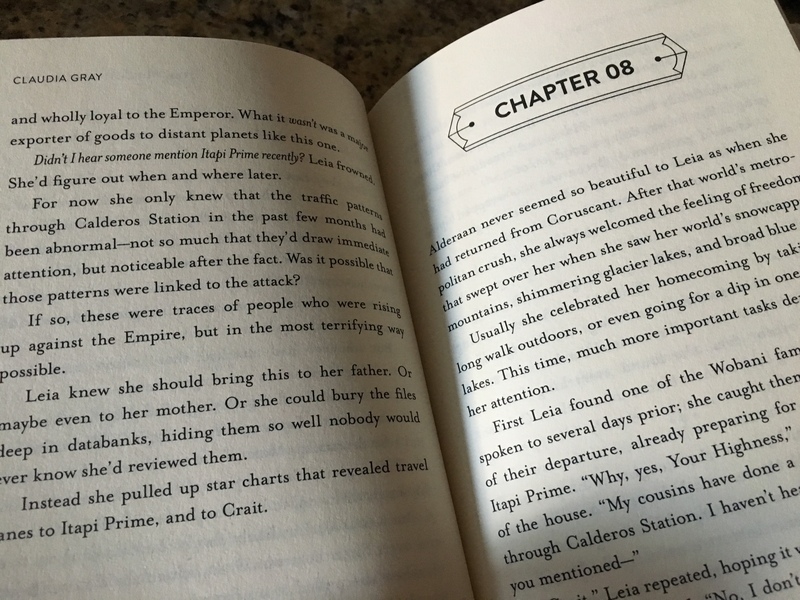 Claudia explores Leia’s teenage years and what it’s like to grow up as a Princess. We find out what the younger version of Leia is like – the one before she met Luke and Han. We learn about her education, the court rituals a princess of Alderaan is expected to go through, we learn about Alderaan itself, and we learn about what her family is like. Claudia explores areas of Leia’s life we’ve never had the chance to see before and does so in an engaging style. Somehow Claudia has tapped into the essence of Princess Leia. She is able to see into different aspects of her personality and give her more life than anyone has before. I’m most impressed at how easily Claudia adapts her writing style to Leia’s age. In Claudia’s first Leia book Bloodline, Leia is older and the entire book is more sophisticated and intricate. Taking place after the destruction of the second Death Star, Bloodline explores Leia’s life after her time in the Senate and during the creation of the New Republic. But the Leia in Claudia’s newest book is still young, still somewhat sheltered, and learning about life. She is obviously intelligent, kind-hearted, and saavy, but still innocent in many ways and Claudia isn’t afraid to delve into that side of her. The book begins with Leia’s Day of Demand, a coming-of-age ritual for heirs to the throne. On that day, Leia has to declare three challenges she will overcome before being officially deemed worthy of the throne – heart, mind, and body. The story is framed around those challenges but Claudia uses that structure to tell an intriguing story about Leia’s maturity into a leader and the beginning of her involvement in the Rebel Alliance. What made the story especially page-turning was Claudia’s focus on the political side of the Alliance’s formation. This is a side to the story we rarely see and Claudia does it so well. She also gives us glimpses into Leia’s first encounter with Grand Moff Tarkin, her encounter with the former Captain Panaka, and her relationship with Captain Antilles. And her first love. Without being cheesy or overly romantic, but with enough depth to make their relationship meaningful and real, Claudia shares Leia’s first love in Leia: Princess of Alderaan. How they meet, what happens in their relationship, and what happens to him are best left as a surprise for those of you who choose to read this delightful book. If you are a big fan of Star Wars and especially the original trilogy – this book will be something you enjoy. I saw this one day at Wal-Mart; it was sitting right next to the new book Phasma (Ironic). I didn’t buy either books, but they both intrigued me. I’ve never really thought a whole lot about Leia; usually Darth Vader or Han Solo. But this book makes me want to take a look at her life. I hope to buy the book soon.